You know that delicious aroma that you get when you are sautéing or frying onions? Doesn’t it smell wonderful? Well this pie tastes like that! Only better. As I’ve mentioned in the past, pites (pie for Greek) are a great vehicle to get a lot of vegetables in your diet, but it was also a way to make a meal out of nothing. Homemakers like my yiayia would make wonderful pies with just some dough and vegetables or wild greens they had in their garden. Onions, normally are used as an ingredient to provide flavor, but never the main component. Here the onions play the main role. Don’t let that worry you. 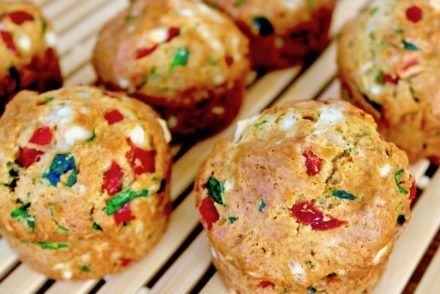 The onions are cooked before so that they become soft and sweet and along with feta which provides additional flavor and substance and the egg which provides some protein and you have a complete meal. Onions are a rich source of an important antioxidant, quercetin. Studies have shown that quercetin has several health benefits such as prevention ulcers, protect the heart and may even be able to increase bone density. 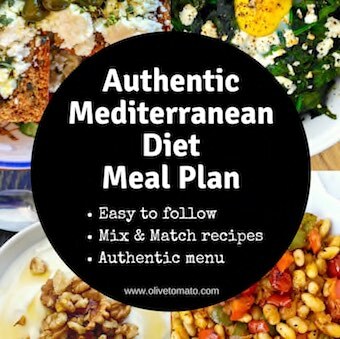 Apart from the onion, you also have antioxidants from the olive oil and a moderate amount of carbs from the phyllo. Preheat the oven at 350 degrees Fahrenheit (180 degrees celsius). Sauté first the mature onions in 3 tablespoons of olive oil for 2-3 minutes. Add the spring onions and sauté for an additional 6-7 minutes until soft. Add the herbs and some salt and pepper. Mix well and remove from heat. 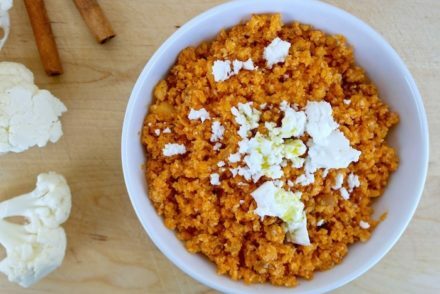 In a large bowl mash the feta, soft cheese and yogurt with a fork. Whip the eggs and add to the cheese mixture. Add the cooled onion mixture to the cheese mixture and blend well. 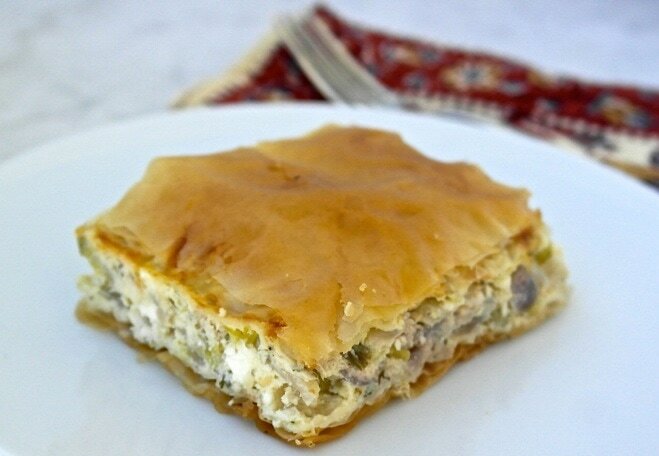 Take a pan (I used a 10 X 12 inch pan), brush with a bit of olive oil and spread the first phyllo sheet, brush the sheet with olive oil and layer another phyllo sheet and brush with olive oil, continue this so you have a total 6 sheets. Spread the filling on top of the sheets. Layer the rest of the sheets on top of the filling brushing each one with olive oil. Score the pie in as many pieces you prefer ( I cut in 9 large ones). Bake in the lower level of the oven for about 1 hour. This is best enjoyed at room temperature. These also freeze well. Yum. How much feta Elena? Thank you for noticing that Cheryl. I just edited it, it is about 8 ounces. Thankyou. It’s on the weekend’s list. Looks delicious! I like sauted onions a lot! I am planning to make pites with pumpkin and spinach. 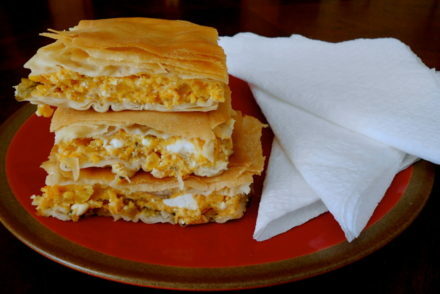 Can you tell me if Greeks ever use pumpkin to make pites? Are you familiar with the Cephelonian lamb pita with rice? I am familiar with it, but have never made it. Thanks Zuzanna! I have a pumpkin recipe posted on the site. Ωραία πίτα και τα κρεμμύδια γλυκαίνουν μαγειρεμένα. Is there a good recipe online for making phylo? These pies all look delicious but I can’t afford the premade stuff. 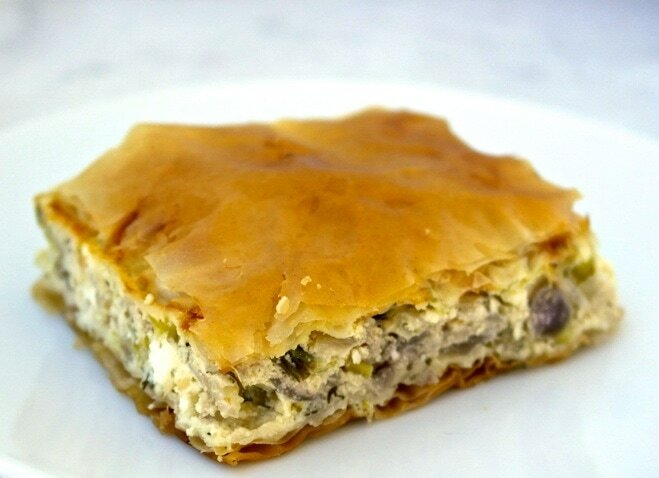 Hi Rachele, The really thin phyllo like the one I recommend here is rarely made at home as it needs to be rolled out to be paper thin, but very often the homemade phyllo is a thicker phyllo that is called horiatiko phyllo (my grandma used to make it). You only use 2 layers: one on top and one on the bottom. I have been experimenting with different recipes and will be posting soon. Ok. There are several places that also deliver. Maybe that might a solution. ich bin auch drauf gespannt, wo bekommt man den das dann, bei google play? habe android. warum wird das eigentlich fÃ¼r apple eher rausgebracht, die meisten haben android.